We had decided to go Dominion early on but I was still debating what class up until the time I got into the game. I had the most experience on a Spellslinger in beta but I was torn between that and an Engineer. In the end, I decided on the Engineer. I love pet classes, even though the bot pets of the Engineer are buggy as hell (more on that later!) and I kinda wanted to tank. I normally don’t go for “furry” races and I almost never go for a “cutesy” race but there is just something about the Chua. They are just an amazing race. Cute? Yes. Furry? Yes. Absolutely psychotic? Most definitely. They look like a Mogwai but have the attitude of a Gremlin. And they can build stuff. Stuff that blows up and kills everyone. That makes for a fantastic race, in my expert opinion. The last choice I had was path. I concentrated on Explorer in beta but quickly came to realize that GW2 had me burned out on jumping puzzles. I just couldn’t do it. Scientist seemed boring and Soldier seemed like just more mob killing. I had a feeling I was going to kill thousands of mobs while leveling anyway, I didn’t need more. That left Settler, so that’s what I settled on. 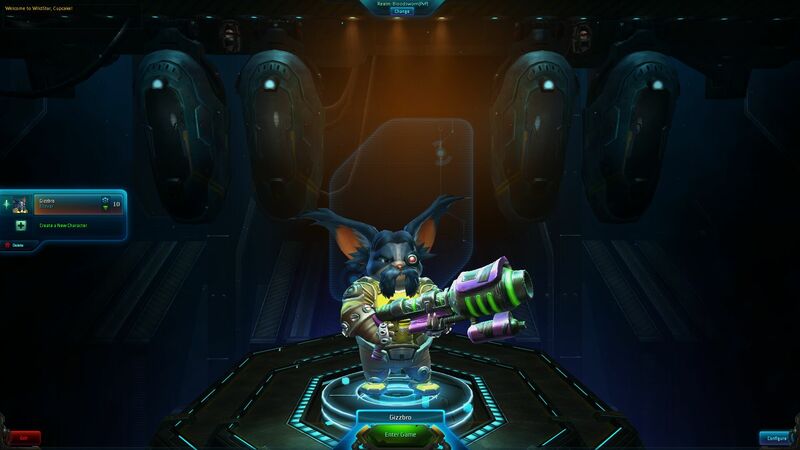 So, without further ado, meet my Chua Engineer, Gizzbro! Cute little bugger, ain’t he? I wasn’t able to do a lot of playing during headstart because I, of course, had to go back to work the night after it started and work until the day the game released. Pretty much all advantages of having a headstart were lost to me. However, I have been leveling all night and have reached level 11. I actually got higher in beta but that was by doing a bunch of PvP, meaning I didn’t really get to see a lot of the quest material after level 7 or so. This time, I have not touched PvP, as I do not want to out-level my quests (speaking of which, they need to add the ability to turn off PvP experience so this does not happen!). The quests are fairly standard MMO quests. Lot’s of kill stuff, pick stuff off the ground, talk to this guy or that guy. Pretty bog standard questing. But, its well done and, while the story isn’t terribly great or anything, the character of the game lessens any of the leveling pain. Its just a fun world. Probably the most fun world I have experienced since WoW. Whereas Rift had a fairly bland world, Wildstar is the polar opposite. In this case, it is truly the anti-Rift. There is a lot of humor here. Wacky NPCs. Funny mobs. Crazy environments. It’s leveling experience is not any different from Rift’s, from a mechanical point of view, but its just so damn interesting that you don’t notice it. Another thing that I am enjoying is the difficulty of the game, even while leveling in the open world, and the ability to adjust that difficulty as you go. Interspersed with the normal mobs are “epic” mobs of the same type. They are quite a bit more powerful than their brethren but still doable solo if you are on your toes. If you just stand their and fight them like a standard mob, there is a good chance you are going to die. If you dodge, stay out of the telegraphs and use your abilities properly, you can take them down solo. The cool thing about it is, they count more on your kill quests. So, if you get a kill quest that tell you to kill spiders, you can kill 15 normal spider or, perhaps, half that amount of “epic” spiders. It allows some variety to the normal kill quests and its all invisible and under the hood. No having to take a separate quest, just do it and decide which way you want to go. I am doing to finish out this post with a list of what I am liking about the game and what they need to work on. At this point, there is going to be more in the like column, let’s see how it turns out in a couple of weeks! The Settler really adds something to the game. You can build speed buff machines, XP buff machines, machines that buff different stats. They stay in the same place (normally a quest hub) and can be used by anyone, not just yourself. It makes me feel like I am helping not only myself, but everyone else in the area. A nice plus. The Lopp. The Lopp are a NPC race that looks like a bunny rabbit version of the Chua. Huge ears, funny face and a hilarious accent. They also seem to love “shinies”. One of the many things in the game that brought a smile to my face. At low level you can rent mounts. Rent one and you can ride all over the place until you dismount. After that, its gone. Why hasn’t anyone else thought of this? The taxi service. 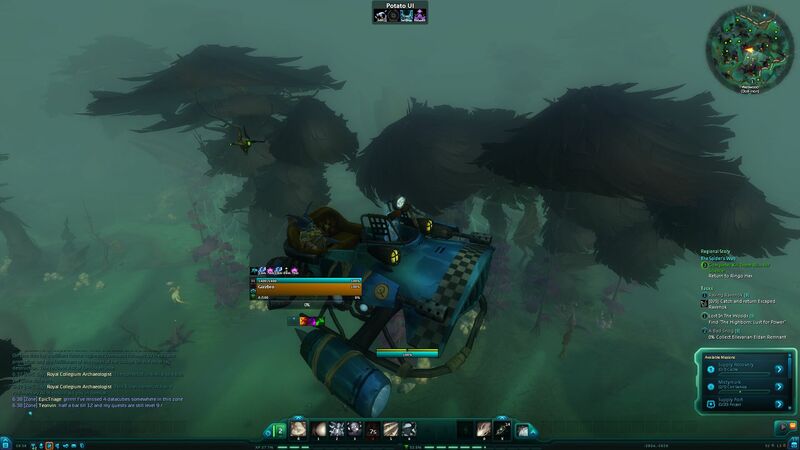 Its a flying taxi, basically identical to a WoW gryphon. I have always preferred that to a teleport between hubs. Yes, it takes longer but it makes the world seem bigger and allows for some sight seeing while going from one place to another. Gotta love it. The visual clutter that I mentioned in my previous impression posts seems to tone down as you advance. The game looks much better as you level and while there is still some visual clutter, its not near as noticeable. I like how abilities are set up. You get eight at any one time, which you can switch out if you are not in combat. Seems to be enough for variety and to get the job done but few enough that you don’t run into ability bloat like in WoW. The guy who makes an announcement every time you level up or die is pretty hilarious. His voice sounds really familiar, I am going to have to look up who that is! As mentioned above, the pet bot AI for the engineer is horrible, especially the bruiser (tank) bot. The pathing is poor, they bug out frequently and the tank bot can’t hold aggro for more than a couple of seconds. They are in pretty poor shape at the moment. Hopefully, Carbine puts a lot of work into that AI. Likewise, the customization of the bots is nonexistent. They all look the same from one character to the next and you can’t even rename them. Every Engineer is running around with identical bots. While the Settler Path seems to help everyone in the zone, I haven’t found anything helpful to me about the other Paths. Is there something I am missing? I can set up machines to buff everyone in the zone but the Scientist can’t do something to help me? Or the Soldier? Or Explorer? That doesn’t seem fair but maybe I am missing something? The UI is still buggy at times, especially nameplates. They disappear and reappear randomly. I am using a number of mods to improve the UI but the current nameplate mod (Biji Plates) seems to suffer from the same problems as the stock nameplates. The icons for dropped gear are poor, in my opinon. The icons for each level of gear look identical, so its really hard to find the gloves you just dropped when all the glove icons in your inventory look the same. Minor gripe but its a problem. This is a much bigger problem; there are still framerate issues. I think it mostly involves AMD cards and processors as NVIDIA has already released tweaked drivers for Wildstar, but they are still there. Hopefully, AMD will get out new drivers soon for Wildstar but its a pain right now. My FPS fluctuates between 25-50 and can sometimes drop into the teens. This is pretty poor considering I have a pretty beefy machine. All in all, I am really enjoying the game. I have gotten used to the telegraphs and the world is just fun. I will have more reports of my adventures in the coming days. Really looking forward to my first dungeon! ← Help my family see my daughter graduate from Boot Camp. I am HATING and I mean HATING challenges. If it was limited to one every so often then fine but they seem to happen every 20 steps or as soon as you kill a mob. Did i mention i hate them? I don’t hate them, they are cool if you want to take the time to do them. You can totally skip them if you want and have no negative consequences from doing so except for less minor loot. I do them when I can, ignore them when I don’t feel like doing them.